IMCDb.org: 1975 Opel Kadett Coupé Berlinetta SR [C] in "Comme un boomerang, 1976"
I don't consider myself as an Opel-specialist... but the GT/E had a different colour scheme (lower half black or yellow, upper half yellow or white). This model was (at least in Holland) a Kadett [c] 1200 S Grand Luxe SR, maybe in France it was Berlinetta SR. Grand Luxe / Berlinetta because of the chrome trim around the side windows, SR because of the black bonnet and striping (and thougher shock absorbers, more meters on the dashboard and different tyres). 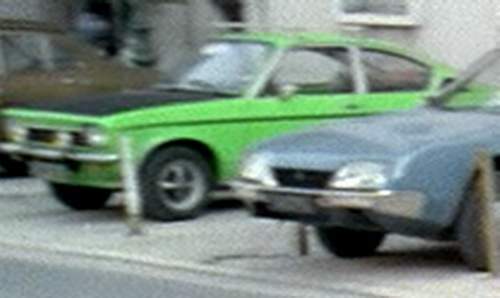 I think the SR was new for 1975, though the coupé model itself was available in 1974 already. Not sure about the date, though.